Samsung Techwin Europe has supplied 35 Samsung Open Platform WiseNetIII Full HD cameras to ensure that the club’s customers can enjoy playing bingo in a totally secure and safe environment. 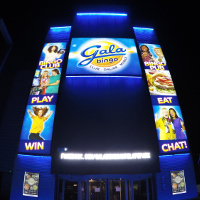 Although Gala Bingo has an ongoing programme to refurbish and update its’ clubs throughout the UK, the Southampton club is the first new build that the company has opened for some years. Gala Bingo has invested over £5M in the new club which is located at Antelope Park in the Thornhill district of Southampton. It is a clear sign that the company has confidence in an industry that has been struggling in recent years and that it intends to continue to expand its business by providing the best possible environments for its customers to enjoy the social aspects of playing bingo. The club offers players a new bingo experience with two distinct areas to play; Bingo Club and Bingo Pub. The Bingo Club is aimed at traditional bingo players who want to get their eyes down and focus on the numbers, whilst The Bingo Pub is a more relaxed area for players who like to chat and relax whilst still playing the same bingo games in a more informal way. The contract to install the video surveillance system was awarded to Nottinghamshire based Link Integrated Security Services Ltd, a Silver Partner of the Samsung STEP (Samsung Techwin Eco Partnership) programme which has been introduced to provide Samsung Techwin Europe’s network of sales channel partners with the resources and tools to help them increase their share of the IP network based solutions market. Link Integrated Security Services Ltd worked closely with Samsung Techwin Europe to design a solution which would cover all the public areas without having a negative impact on aesthetics of the brand new club. The WiseNetIII camera models installed by Link Integrated Security Services Ltd at the club include SND-6084 2MP domes as well as SNO-6084R bullet cameras which have built-in IR LEDs to ensure high quality images can be captured in low lit areas of the club. The cameras are able to take advantage of the high performance WiseNetIII DSP chipset which has the processing power to simultaneously run multiple edge based applications. This provides Gala Bingo with the opportunity to utilise specialist onboard video analytics applications, such as people counting and heat mapping. A number of SNF-7010 3MP 360 degree fisheye cameras have also been installed to cover areas of the club where a much larger number of fixed cameras might normally be required, to avoid any blind spots. The images captured by the cameras are being recorded onto a Samsung SRN-4000 Network Video Recorder (NVR) which provides a highly resilient, low maintenance recording solution. Its features include a built-in RAID hard drive ‘Hot Swap’ facility which ensures that recording is not interrupted if a fault occurs. Voted CCTV Product of the Year 2015 by the readers of PSI Magazine, the SRN-4000 can handle the images from up to 64 cameras and so provides the ability for additional cameras to be installed at the club should there be a requirement to do so in the future. Link Integrated Security Services also installed Samsung Smart Viewer software to allow authorised users, such as Kevin Willis, to remotely monitor and manage the images captured by the 35 cameras.